Hey all! We had a great turnout and received 23 awesome submissions! Unfortunately due to size restrictions on the cart, we were only able to accept 9 of them for the cartridge release. The remaining tracks will be included in the digital release as b-sides (though they really are a-sides). We're taking preorders now. These are the only carts we're going to produce, so get your preorder in ASAP. A brand new album on a cartridge exclusively for the Sega Genesis coming summer 2017! "Hot dog fresh off the grill in one hand, a cold bottle of coke in the other. The sun is setting over suburbia and the neighbors are setting up lawn chairs on the curb. It’s been a day full of festivities from bounce castles, slip n’ slides, and way too much cotton candy. Not that you’d know, you’ve been upstairs in your bedroom playing your Sega Genesis all day. After a hot day, it’s cooling off just in time for the main event: the fireworks. Lay a blanket out on your lawn and get comfortable because it’s YM2017!" The paragraph above is the theme for the compo. Interpret it however you'd like! Sounds like a great idea! Is this completely open to anyone? Won't there be a limit of how many tracks you can fit on the cartridge? I'm all about it. I'll try to get something together for this. Anyone is welcome to make a submission. Generally songs will be chosen based on quality. I don't expect that to be a huge problem, but low quality submissions won't make it into the release. I don't think anyone needs to be super worried about that though! Yeah, there will be a limit of course, but songs tend to be rather small. A sample ROM we looked at ended up being less than 512KBs with 14 tracks! guess I should learn deflemask! I'll have to pray about it. But I've been working on doing FM drums with no PCM sample usage. So we'll see what happens. Nice! This could be something to make me work on Deflemask! You can use VGM Music Maker to write your song as well! Basically anything that can export a .VGM will work. I've included a download for it on the website. Awesome! Thanks, VGM Music Maker is legit! 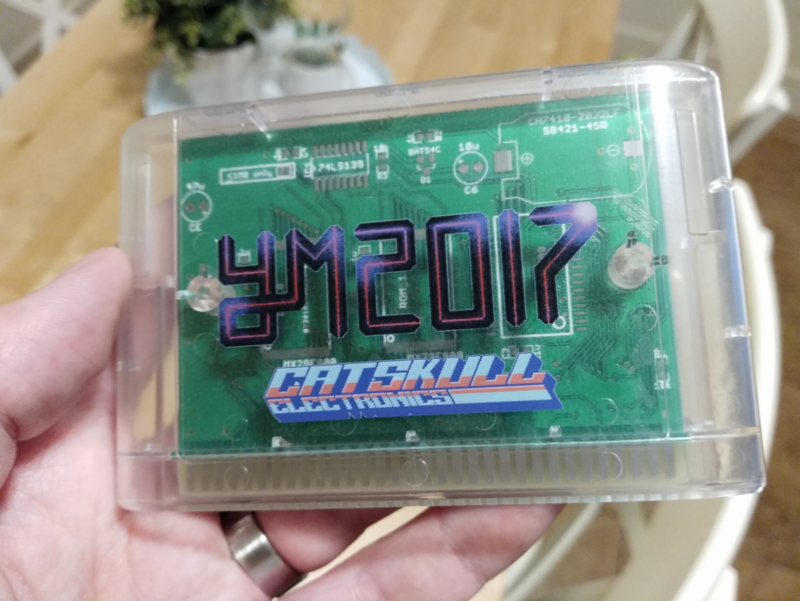 I had some cart labels printed up as a test for YM2017. It will be a clear cart shell with a clear label. The design is nowhere near complete, but I think the look will work! There's still plenty of time to get your submission ready! Really looking forward to this release! That cart looks amazing! The clear case works really well. Nice! What player should we test our song on? if it plays correctly on Deflemask, it should be OK, right? Yep! You can send me a "preview" .VGM so I can make sure it will work correctly as well if you're worried about it!